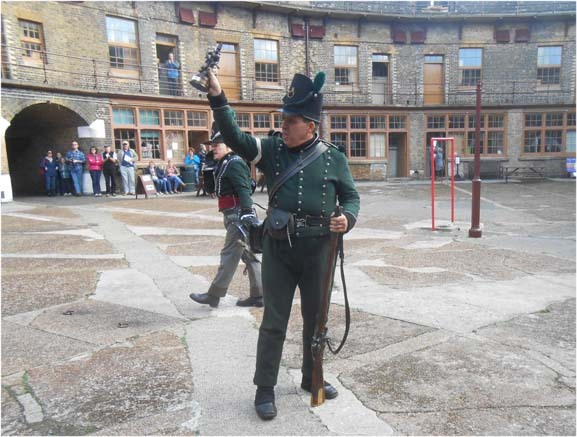 95th Rifles Living History Society representing 1st Battalion 95th (Rifle) Regiment of Foot (1/95) will again be in residence at Landguard Fort , Felixstowe, on Saturday and Sunday, 3-4 October 2015, for our end of season finale. Once again the Fort authorities have kindly given the 95thRLHS permission to use the barracks throughout the weekend. The Society will set up a living history representation of military life in the Napoleonic period, and will exercise foot and musket/rifle firing drill, culminating in the Society's annual Sharpshooter of the Year contest for our coveted Plunkett Trophy. We will, as usual, present a period scenario to demonstrate life in those times. Riotous Assembly will be performing their period music throughout the weekend. We will be happy to discuss the regiment, its history and military life in the period from 1800 to 1816. Interested in Napoleonic re-enactment and joining as a Rifleman? Come and see the 95thRLHS at Landguard Fort and look into taking the King's shilling.